We discussed “planing” in a recent post by looking at power data from a double-blind test of two different bikes. (If you haven’t read that post, we suggest you start reading there.) The data showed that the same rider’s power output was consistently higher on a bike with a more flexible frame than on a stiffer one. On a bike with optimized frame flex characteristics, the rider can put out more power with less fatigue. We named this phenomenon ‘planing.’ How does it work? 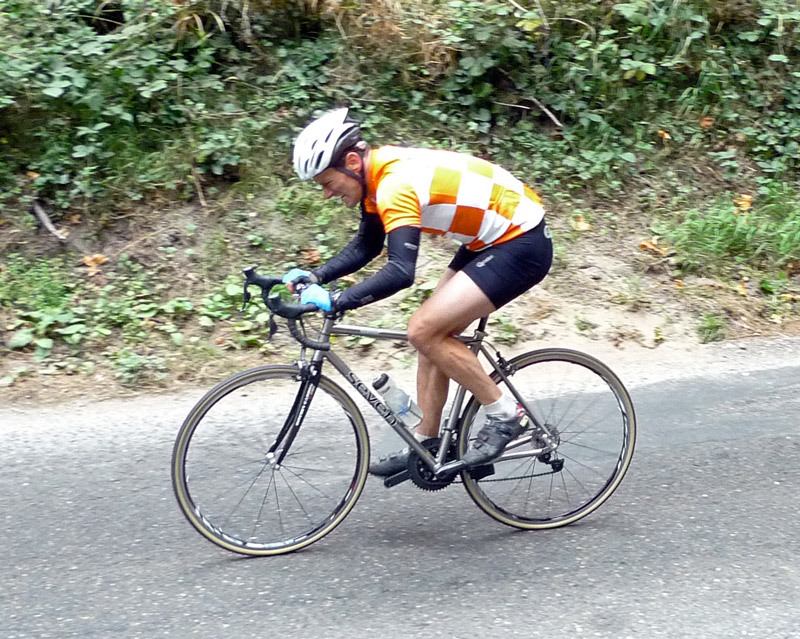 A cyclist’s power output is very uneven during the pedaling stroke. Even a professional racer with a beautiful spin puts out almost all of his/her power during the down stroke. This means that the bike is propelled forward by a series of brief accelerations, rather than a steady force. You can accelerate the bike/rider only so much during the short power stroke. Trying to pedal harder feels as if your legs are pushing against a brick wall. The brick wall analogy is useful, because it shows that you can fatigue even when you aren’t doing work in the sense of physics. When you push against a wall, the wall doesn’t move – no work is done. Yet lactic acid builds up in your muscles, and you fatigue quickly. Back to the bike and the power stroke: Imagine a bike that accepts extra power during the down stroke, rather than pushing back against your pedal stroke. Imagine that the frame stores the energy, and releases it at the end of your power stroke. This would lengthen the power phase of your stroke. Without having to accelerate the bike more, you would be able to put more power into it. This stored energy is released when the pedal stroke approaches the dead spots. The right type of frame flex thus prolongs your power stroke, allowing you to put more power into the bike without having to accelerate it more. In other sports, it is not a new idea to use flex to store energy and then releasing it in a beneficial manner. 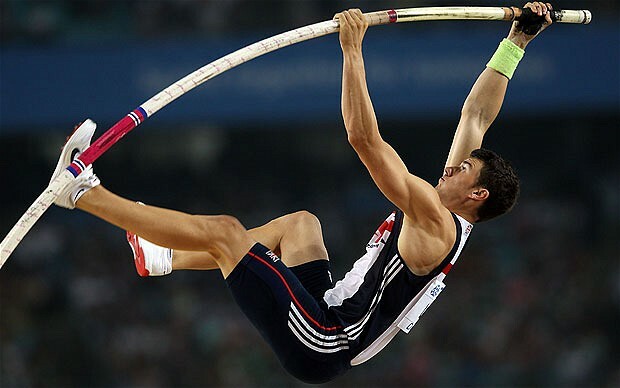 Pole vaulters use this phenomenon, and so did native American hunters with their atlatls. (Atlatls are sticks that throw darts with such force that they could pierce the Spaniards metal armour.) Jump-roping on a sprung gym floor is less fatiguing than it is on concrete. We know that riders can put out 12% more power on bikes with optimized flex characteristics. Our observations during our double-blind test – where we rode bikes that were identical except one was stiffer than the others – are consistent with the idea that the best frames allow us to input more energy with less fatigue. On the stiffer bikes, our legs hurt with a burning sensation. This limited our power output. When we reached the top of the hill after an all-out effort, our heart rate was lower than its absolute maximum. On the more flexible bikes that ‘planed’ optimally for us, our legs did not hurt. The sensation was one of pleasant warmth in our legs, maybe a little tingling. With the legs no longer the limiting factor, our cardiovascular system set the ceiling on our power output. At the top of the hill, we were completely out of breath. Riding these bikes fast was more fun, because our legs didn’t hurt. The last part is the most important for me. I ride my bike for fun, and a bike that is more fun the harder I ride provides more of the exhilaration that draws me to cycling in the first place. The bikes that ‘plane’ best for us also are less fatiguing and more fun to ride at more moderate power outputs. On these bikes, we can ride long distances with relatively little mental effort. The act of pedaling becomes subconscious, allowing us to focus on the enjoyment of the ride, the scenery, and the friends with whom we ride. It’s also the secret to covering the ultra-long distances, like the 765 miles of Paris-Brest-Paris, almost non-stop. If the bike flexes in harmony with your pedal strokes, it’ll entice you to go further and faster than you imagined. • Information about Bicycle Quarterly, the magazine that did this research. • Further reading: Double-blind experiment: Bicycle Quarterly Vol. 6, No. 4. Power data from double-blind tests: Bicycle Quarterly Vol. 7, No. 4. • Finite element analysis was done by Gary Houchin-Miller. Great stuff. This has been an ongoing debate: people don’t understand that flex does not directly imply energy loss. “All the power on the pedals goes into acceleration” you see over and over in reviews of the next generation of bikes with yet stiffer drivetrains. This may be how it feels, and it may feel fast, and in a competitive sprint a fraction of second delay in power going into propulsion may be beneficial (yet Sean Kelly was remarkably successful on one of the flexiest production frames of the last half-century, the Vitus Aluminum), but for steady-state pedaling, as you note, a fraction of a stroke delay in power going from the pedals to the road is irrelevant: you spend half your time putting power in, half getting power out. The key is the where the energy goes: if it’s lost, it must be dissipated somewhere. In the frame? Hardly: frames are efficient resonators. In the body? No reason to believe this biomechanical loss is more with pedaling a flexy frame than with a stiff one; the pedal trajectory is slightly different but it’s complicated either way. The obvious energy sink for flex is the drivetrain…. move the bike forward. Despite all the talk about stiffness, many of the best bikes aren’t actually all that stiff. I recall reading somewhere that Lance Armstrong rejected a Trek prototype as being too stiff… Fortunately, light weight and stiffness are opposing goals, and weight is easier to measure. 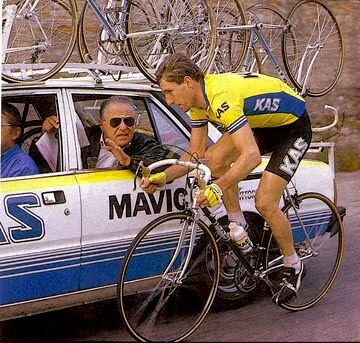 As to the professionals who raced flexy frames, it’s not just Sean Kelly on his Vitus. Andy Hampsten won the Giro on a bike made from standard-diameter 7-4-7 tubing, the same tubing specs as the “superlight” frames in our tests. LeMond raced TVT carbon frames that he considered very flexy. There are many other examples. Kelly’s Vitus was built of steel, painted to look like a 979. Kelly did race on some steel frames, especially toward the end of his career. One of his steel bikes is shown in our book The Competition Bicycle. However, most of his victories were on actual aluminum or carbon Vitus frames – they are pretty easy to identify – look for the sloping internal fork crowns and the distinctive seat clusters. Examples are here and here. I am a big fan and BQ subscriber, and have an engineering background. It would be intriguing if you could partner with a university’s Mech Eng Dept and do some lab testing of your hypothesis. Do you think the big bike mfgs have done this? Sure they have done stress/strain for the structural integrity of the bike, but a study from the standpoint of energy conservation or storage? Jan, I am a mechanical engineer professionally licensed in several states. My work includes designing machinery. I commend you on investigating this interesting phenomenon and explaining it so clearly. It seems that a more flexible frame allows a smaller, but more consistent force to be applied over a longer time. In other words, that a graph of force versus time for the flexible frame would look like a plateau and for the rigid frame would look like a peak. I can understand that the peak force on the more rigid frame would tear and fatigue leg muscles while being so momentary that it does little to increase the velocity of the bicycle. The planing phenomenon makes sense, but is definitely not intuitive. Thank you for your hard work. Is there a frame set up in which reducing the moment of inertia and increasing the moment of inertia among the frame members contribute to planing and more power into the drive train? I guess that members such as downtube, top tube and chain stay would be better as flexible members while the seat tube would be better as a stiffer member. Don’t the tires flex a lot more than the frame? Would certain types of bike suspension have a similar effect to the “frame flex” described? Suspension in MTB forks and full-sus bikes has a different purpose but some small wheel bikes (Moulton, Brompton) have a type of suspension although maybe these types of bikes are just too different to have a valid comparison with frame flex on larger wheel bikes. Yes, suspension can have the same effect. We once tested a Trek 2100C with an elastomer in the seatstays. It came with three elastomers. We made a forth insert out of delrin that had the effect of no suspension at all. The results were interesting: Without suspension, the bike felt like an inexpensive oversized aluminum frame: dead and hard to get moving. Same with the stiffest elastomer. With the medium elastomer, the bike was transformed, and it climbed really, really well. With the softest elastomer, we couldn’t get in sync with the frame. Maybe there is a resonant frequency at play here. The stiffness of the frame and the weight of the rider would combine to give a frequency of oscillation. This then ought to couple to the cadence… not sure what the optimum relationship should be, though! Here is a fun experiment: check out the effect when people get out of the saddle for climbing. That slows down the cadence and also shifts the orientation of maximum torque relative to the frame. Sure seems like a frame optimized for seated higher cadence would be different from one optimized for standing lower cadence. Good observations! The experiment of seated vs. standing has been done in a way: During the 1960s, many professional raced on standard bikes with 9-6-9 or 8-5-8 tubing. (The numbers refer to the wall thicknesses: 8-5-8 means 0.8 mm walls at the ends and 0.5 mm in the middle.) However, for time trials, they had superlight bikes with 7-4-7 tubing that is much more flexible. In a time trial, you ride at constant effort in the saddle. 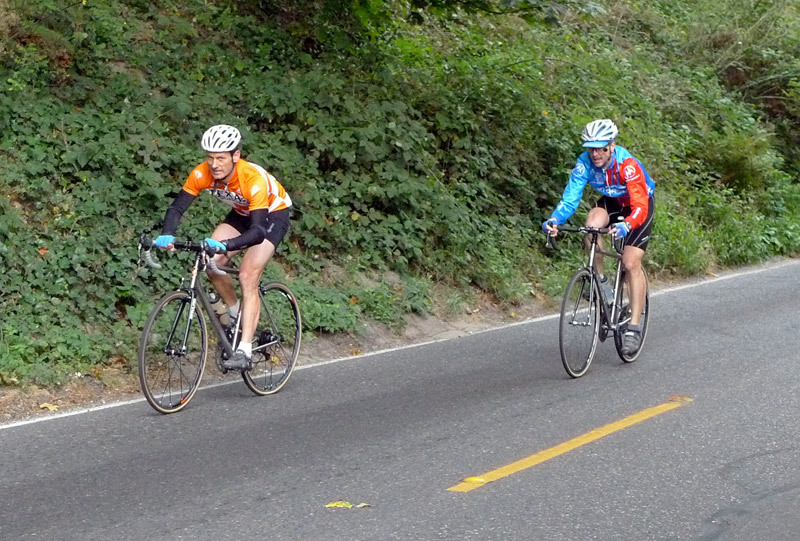 Road races are won in short bursts, often out of the saddle. Similarly, I find that on stiffer frames, my cadence needs to be lower to make them work well for me. Sometimes, it takes a few days and maybe 100 miles until I adjust to a frame’s different flex characteristics and can make it plane. Just throwing this out there as added thought for food (lol). To me, the most important aspect is the interface between rider, a biological organism, and the frame, which is a mostly unyielding mechanical construct. In my experience, the most important point of this interface occurs between the seat and seat tube and the rider’s posterior, where the most weight resides. As pointed out elsewhere, the seat tube is most beneficial when stiff, but will also impart sudden and tiring road-induced shocks to the rider’s spine and body. So when we talk about flex and stored energy rebounding from a more flexible frame, we are also talking about a certain perceived comfort factor. Because I find this sort of inflexibility between frame and rider to be the most tiring aspect of riding long distances, I have resorted to inserting an elastomer where it is most needed: a suspension seat post. Because many manufacturers have finally listened to the wave of Fondo riders, they are attempting to create more comfortable “sportive” or Fondo frames. Perhaps suspension seatposts with different elastomer inserts will find more acceptance as well? Look has recognized the problem and has decoupled rider from frame in ingenious fashion through a sleeved seat post insert suspended by an elastomer ring on the exterior and a cabled support in the interior. The Slingshot bike is marketed around this idea, as is the next generation ERB frame. I picked up an ERB (Energy Return Bike) frame this fall and built it up. It’s interesting. It does feel quite lively and great under acceleration. However, when I rode it back to back with my ’83 Trek 620 newly converted to 650B with Loup Loup pass tires, the Trek subjectively blew it away (the ERB was on Performance Metro 700 x 35mm tires). The Trek has a 25.4 8/5/8 top tube, but it never felt so good with other tires. Which is a long of saying, I enjoy planing or energy efficient bikes, however they work, but I think tires make a bigger difference. Tires make a huge difference in performance – more than any other component even at relatively high speeds. You can reduce your wind resistance by 3% if you get aero wheels. That is significant, but it pales compared to tires: The reduction in rolling resistance when you replace a puncture-resistant touring tire with a high-end, supple tires can be as much as 50%. Something I read repeatedly on Moulton email groups is new owners exclaiming how freely or effortlessly their new Moulton rides. I see such remarks often enough that I do not think it is due to new-bike placebo effect. Curious, would a fixed gear and or track frame benefit from planing? I am trying to wrap my mind about what you’re saying, bear with me. It sounds like you’re talking about frequency of the bike structure (which can be calculated). Similar to pushing a swing, when you push in frequency you can push the swing to a further distance. So when bike and rider’s cadence are in sync then efficiency is maximized. I would like to see Bike Quarterly publish that quantifies the forces to which a bike frame is likely to be subjected. Shimano used to make a crankset for their Nexus line where the chainring was mounted on a bushing and could rotate slightly around the bottom bracket spindle axis . An elastomer spring connected the ring to the crankarm. The idea was that the spring would absorb some of the peak pedal forces and protect the mechanism of the matching internal gear hub. A similar design with adjustable spring tension would be a good way to test whether the planing effect is due to energy stored within the drivetrain and not due to some external biomechanical factor. due to energy stored within the drivetrain and not due to some external biomechanical factor. I think we really need to look at both these elements together. After all, the energy stored in the drivetrain (or frame) is helpful only because it works in conjunction with these external biomechanical factors. If we pedaled at 8000 rpm like a motorcycle engine, then we wouldn’t have these peak loads and frames would be designed very differently. An energy-storing crank would make it a lot easier to quantify and test things, instead of trying to figure out what the frame is doing. By ‘external biomechanical factors’ I mean possibilities external to the drivetrain, such as the flexing of the frame providing a better leg path relative to the hip joint, difference in pronation/supination at the foot, and so on. To follow up on James Kukula’s comment: Is it true that planing is relative to typical pedaling torque on the crank/bb spindle and therefore not only to weight and cadence, but pedaling style and gear? So that, for example, even a light rider who “mashes” would find that a stiffer frame planes? Pedaling style and optimum frame stiffness/flex characteristics definitely seem related. My “favorite” gear depends on the bike – it’s lower on my Urban Bike than on my randonneur bike. I tend to pedal at about 110 rpm on the flats, and about 95-100 on significant uphills. Does this mean that, with a frame that planes well for the rider, it might be more efficient (plane more) if that rider concentrated on the downstrokes (as many inexperienced cyclists do) rather than on a smooth spin (as seasoned riders and professionals work so hard to develop)? The basis of my question is that maybe more force flexing the frame, on the downstrokes, would create more springing and stored energy. Another basis for my question is that I’ve met a few people who were very novice cyclists – but were strong and in good shape, and presumably just mashed the pedals down as opposed to smoothly spinning the crank – yet could ride surprisingly fast. (In one case I group toured with a guy who was hard to keep up with despite the fact he rode flat pedals with no toeclips instead of SPDs like the rest of us, and carried a cast iron frying pan, a small, whole chicken (until he ate it on out first camp), and a big jug of water in his panniers! It shocked and delighted the racer types on the tour; they wanted to get this guy out on the velodrome. He eventually fatigued two days in, but wow could he ever ride. He rode a skinny tubed, mid level, 80s road-sportif bike of some sort, so I’m sure there was some planing going on). Also, would bb spindle length or crank arm length affect leverage and have any effect? Studies have shown that even with a “round” pedal stroke, almost all the power is developed on the downstroke, so it probably doesn’t matter. In theory, spindle length and crankarm length should have an effect… Crankarms commonly vary only by very small amounts, so the effect should be minimal. The wider tread (Q factor) of some cranks might flex the frame more, but also might inhibit your spin. So the frame should be tuned to the weight and strength and pedaling style of the rider. I am much older and less strong than I once was, so my frame should flex a bit more easily than it did 20 yrs ago, right? With continuous monitoring many times per stroke, and many strain gauges on the frame and cranks, a smart modern mechanic should be able to describe power in and power out at various phases of the pedal stroke, and get a Ph D at the same time! I would appreciate it if you could tell me where I could access the finite element analysis study that shows the energy stored in the frame is transferred to the drive train. The study originally was published online on Gary’s “Bikethink” web site, but like so many things online, it turned out to be ephemeral. Fortunately, we also published it in Bicycle Quarterly Vol. 4, No. 4, and that one still is available. OK, I carefully read the bikethink article. If I understand correctly, the frame stores energy in the first part of the stroke (tdc to 3 o’clock), then as the fd decreases in the rest of the power stroke (3 o’clock to 6 o’clock), the frame returning from its flex also allows the potential energy that is also in the chain to be released, moving it forward and helping to drive the bike. I think the key is that there must be a constant load on the pedal between top and bottom of the stroke. Were we to stop pedaling when we reached 90 deg, would any stored energy from the frame be transferred to the chain? This is the part that’s hard to get my head around. But today, I went for a ride to try to feel the “planing” as I rode up various hills. I rode thru a section of light snow. Applying constant force to the pedals, I noticed that the rear wheel slipped on the ice/snow when my pedals went below 90 deg (3 o’clock), and this slipping stopped when the pedal reached the bottom of the stroke (6 o’clock). Would this slipping (excess power that did not occur at the start of the stroke as the frame was flexing – noon to 3 o’clock) have been a result of the frame returning energy to the chain? Is planing still going to happen on a tandem with the pedals set ninety degrees out of phase, or does one need to tune the relative phases of the captain and stoker to take advantage? That is a good question. I suspect no, since all the out-of-phase experiments haven’t really led anywhere. Performance tandem teams generally prefer their cranks in phase, even though in theory, out-of-phase should even out the power strokes. Riding a tandem with my non-cyclist wife, I found both a sense of planing and better handling with the cranks a few degrees out of phase. Even she noticed the improvement. The shift was arrived at intuitively, and probably gets us in sync while having different power, pedal strokes, body types, and seating positions. 3. And finally, whether your readers who find this explanation compelling have experience in bicycle road racing. The effect of constant full gas accelerations in racing, in my experience, favors stiff frames. I have found stiff frames faster in racing (for my body type which is more sprinter than climber), which I think varies significantly from the type of riding you’re doing to generate your theory of planing. I’d be curious if a current pro circuit rider would be competitive in a criterium on your Herse. Jan, thanks for not only thinking about this but also doing studies to verify what you’re experiencing on the bike. 1. Separating the rider from the bike is always futile. Planing doesn’t make the bike faster, it makes the rider put out more power. 3. I find that bikes that plane well make the biggest difference under more moderate power outputs, but even in sprints, I cannot make the stiff bikes move. Many racers seem to agree – nobody raced on drainpipe frames in the old days, even though those were incredibly stiff – although they aren’t aware of the cause. I wrote about that here. The energy stored in the frame from pedaling pulses can only be added to the rear wheel if the riders leg resists the crank arm going slightly back during the dead spot. We are not talking about getting something for nothing here. There could indeed be some improvement in smoothing the pedal stroke with a frame tuned to a certain pedaling speed, but there will also have to be a negative outcome at other speeds. My feeling is that at best this would be a wash and in some cases not good at all. The testing done by Jan is not going to decide this. It must be done in a lab and use Vo2 uptake readings. I have seen test results showing improvement in Vo2 using a correctly tuned Bio-Pace chainring. So why did this fail? It only worked better if it was tailored to the rider. Modern racers use bikes that are very stiff when pushing on the crank, Powertrain flex gets in the way of what they need to do. 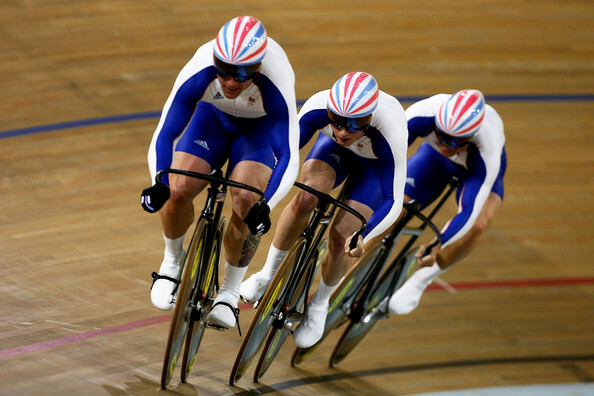 It has been shown that a higher spin at high output can improve a racers Vo2. But this strategy requires matching the rpm to the load closely, leading to closely spaced 11 speed clusters and shifting much more than the old days. One truly interested in performance gains on a bike needs to be willing to use every detail available, not think that state of the art design has gone downhill since 1950. We’ve found that the balance of the frame is important. For example, the Trek Madone and the Surly Long-Haul Trucker had comparable overall stiffness, but the Trek had much stiffer chainstays, and a more flexible top tube. The Madone worked well for us under high power outputs, whereas the Long-Haul Trucker was just like the previous poster described… You are right that the chain pulling the rear wheel will also exert a force on the legs. However, since that force comes right when the leg’s acceleration is waning, it sort of prolongs the power phase, and it doesn’t seem to slow the pedaling cycle. In the end, we can only hypothesize regarding the mechanism, but we do know that some bikes are faster than others for certain riders. One truly interested in performance gains on a bike needs to be willing to use every detail available, not think that state of the art design has gone downhill since 1950. Absolutely – which is why we test carbon, titanium and even suspension bikes. However, it’s also important to realize that the human body hasn’t changed much in the last century, and the bike builders of the 1950s (or 1930s) already had everything they needed to fine-tune the flex characteristics of their frames. Today’s professional racers may put out a little more power thanks to better training methods (to say nothing of other “medical” factors), but the basic way of pedaling a bike hasn’t changed much in more than half a century. Today’s racers still pedal at about 110 rpm, just like the racers in 1950. Powertrain flex gets in the way of what they need to do. Do you know of any controlled studies that show this? I’d be very interested. That was my team’s jersey when I raced for The University of Texas in the late 1980s. There is more material avalable using waybackmachine. and like the tire width conversation, it’s NOT the case (nor does Jan claim it to be!) that huge amounts of springyness would be good. 2. The bike doesn’t weave, wander, rub the chain, or feel like odd waves are traveling through it. That is, it doesn’t feel like a wet noodle. 3. The bike transmits lots of road sensation, sometimes brutally. There’s no particular merit to this, but there’s a “vibe” around it. In Grand Tours, which are often won or lost on the long climbs, the top contenders are always on “conventional” road bike frames, never “aero” frames, even though aero is arguably a factor even on climbs. The shape of of “aero” frame tubes typically creates vertically stiffer frames, and therefore less stored & recoverable energy per the above analysis. Given that racers nowadays usually have a choice of frame , I wonder if the overwhelming preference for non-aero frames among GT contenders, is a subconscious preference because of this ‘planing’ effect? This explains why my steel bikes are more comfortable than your stiff carbon bikes. And aluminum frames range from awful to apparently good. Ti frames can be very lovely indeed. Of course so can Steel. And carbon fiber in some senses allows more elaborate control than any other material because of all the variables in the layup and weave. The concepts of light weight and stiff are so intuitive, easy to sell and safe, while “planing” so abstract and seemingly risky, I wonder if this will bleed over to the mainstream as some of the other BQ findings have. Currently custom steel frames may be the go-to technology to get planing, but without Jan’s level of experience, the average rider is almost shooting in the dark while framebuilders fear under-building frames. As the Calfee and Trek tests indicate, steel, luck and experience may not ultimately be the only or best way to get there. A retrofitable and tunable flex component is an exciting prospect. The fact that this blog post hasn’t really got many negative responses shows how open cyclists are these days to new ideas. I think it’s already gone mainstream in many ways, even though magazines still tout stiffness in their tests. I haven’t seen any magazines actually measure stiffness in many years… so perhaps the safest bet for a manufacturer is to make a frame that has a nicely tuned flex characteristic, but then tout it as ultra-stiff. That way, they have all their bases covered. Because of their purely numbers-oriented approach “Tour” to me lost much of their credibility. Stiffness may be easy to measure, but first, you have to show how it matters. Basically, you have to validate your model. And so far, nobody has ever shown experimentally that a stiffer frame makes a bike faster. It would be nice, wouldn’t it? Once you show that stiffer frames are generally faster, all you need to do to predict a bike’s performance is measure its frame stiffness and its weight… which is basically what TOUR does. However, since the underlying premise appears to be faulty, they might just as well measure any other random variable (like paint thickness or how high the seat collar extends above the top tube). My 68 cm Schwinn Voyager is a complete noodle. Way too flexy to do loaded touring with and still feel in control. Maybe it just needs to be a nice flexy rando instead! Flex should be in the right places… and carrying a touring load on the rear requires more frame stiffness than is optimal for performance for most riders – one of many reasons why front loads on low-riders are preferable on a performance bike. Also preferable on Aluminum tourers, which I am now done with. The front load dampens vibrations on the hands. My fellow tourers thought this was silly until they tried it. Inertia is your friend when damping vibrations. That is why it’s easy to make luxury cars quiet and comfortable, but more difficult to achieve the same on small cars. Funny thing about weight – after I took up cyclocross – the only actual bicycle racing I”ve ever done, I find that yes weight matters, but having the bike handle well and having drivetrain parts that don’t break, and are easy to get and install when they get torn off the bike, matters way more. Cyclocross is the one sport where bike weight matters quite a bit, since you actually have to pick up the bike and lift it! What does that have to do with planing frames? It only points out that any parameter (stiff, light, snappy, high pressure, most reliable…) is only dominate over particular ranges and circumstances. I think it would be very difficult to tune the frame to the rider’s pedal stroke to the last degree, but fortunately, the rider can tune their pedal stroke to the frame, too. So once you get the frame in the ballpark, then the rider can make it “sing” by tuning their pedal stroke to the bike’s characteristics. I know that my pedaling style needs to be subtly different on different bikes. For example, I pedal at a slightly lower cadence on frames made from oversize, thinwall tubing than on those made from standard-diameter tubing. Sometimes, it takes me a few rides (up to a week) to get in sync with a new frame… which is why our bike tests usually go at least over 200 miles (320 km). A bike that doesn’t seem to work well for me at first can feel great once I have adjusted to it. Is not the ‘spring in the drivechain to store up a pulse” just the frame? Seems to me that a maximum pulse is one where the muscles can’t generate more frame flex. Maxed legs are a power limit. Max flex would be frame breakage(theoreticlly). This appears to be one of those calculus 2 variable problems that killed your grade point on the final exam! You also have a classic max-min math problem based on gearing and rider weight. Now you are up to 4 variables. And imagine calculating in the effect of the rider wearing wool vs lycra! Ha ha ha ………but really, what a neat mental exercise Jan has proposed. 1. Maybe this explains why sometimes a rider feels sluggish the first parts of a ride and then feels like their legs wake up in the later parts of a ride? 2. Is it possible that the frame flex also briefly unweights the bike, tossing the rider’s weight upward, thus making the next downstroke easier? 3. I wonder why the paint on a bike doesn’t get all cracked up from all the expansion and contraction of the tubes as they flex. 3. is easy to answer. You can get some pretty significant dents in your frame without cracking the paint or chrome. Even though this is a replay for BQ readers I always love reading your articles/ posts about planing. I’m eager to learn what the roles of the different tubes play in planing. You’ve mentioned that the top tube plays a major role which is confusing because the bottom bracket is flexing and the top tube doesn’t connect with the bb. Figuring out what the ideal setup is for one person is a shot in the dark but knowing the different roles is perhaps an attainable goal. The research so far has been entirely empirical. Basically, we ride tons of bikes, both as part of our normal testing routines and specially-made bikes for the double-blind test, and then we look at trends in the data. So we found that bikes with oversize top tubes, but standard-diameter down tubes (both tubes the same diameter) don’t perform well. And that stiff chainstays seem to help performance. And that superlight oversize frames can perform very well under higher power outputs. And so on. Interestingly, in our discussions with Japanese Keirin framebuilders, it appears that they have come to similar conclusions. I’ve “discovered” planing in the ’80s , seemed those vitus 979 were power assist… Always wondered what would happen with a very stiff frame and a kind of rubber band instead of a chain? Just adding a little “grist to the mill”. I recently took the rack off the back of my LHT (and the handle bar bag off the front), and noticed that the bike was actually a bit more stable. With the rack on the back, and no bag up front, I couldn’t think of taking my hands off the bars. With the rack (and bag) off the bike, I felt it was possible (though not the most confident). I first noticed this when I found I was able to ride “no hands”, when I was carrying a 10# bag of apples home in my handlebar bag. So, it is my hypothesis that stiffening up any one part of the bike will affect the rest of the bike, in terms of both handling and planing. I still have the rack off, but the bag back on, and I’m expecting a little more stability on tomorrow’s ride. A rear load always will be harder to balance than no load, even on a bike optimized for rear loading. Even a front load on a low-trail bike will raise the speed at which the bike is easy to ride no-hands. The only load that truly stabilizes the bike even at low speeds are low-rider panniers on the front forks. I’m the owner of a Surly Long Haul Trucker (Disc Trucker, actually) and it’s a slug. It’s got middle-range components (a mix of Shimano 105 or better, Deore XT and other components from other manufacturers that are equivalently mid-range). Overall, the weight difference between my Trucker and a similarly middle-range equipped ultralight-tubing sportive is less than the weight of a water bottle (and pretty much none of the weight difference is rotating weight). If ‘stiffness’ really made a bike faster, then my Trucker with 1 water bottle would handily beat an ultralight tubing bike carrying 2 water bottles. This is definitely not the case. My Trucker is probably one of, if not the stiffest production frame made and it’s slow and tiring. I have other, much more flexible frames and they are very different in ride quality, and very much faster. When I push down hard on the pedals on my Trucker, it’s like pushing against a wall. There’s no give or spring and my muscles experience a much higher peak effort. There’s pretty much a direct connection, with little to no give, between my pedals and the tires. It’s exhausting. On my more flexible frames, when I push down hard on the pedals the frame flexes and stores energy, preventing me from being able to exert nearly the same peak effort. However, while the peak effort is lower, the average power output is higher, making the bike overall faster. Muscles are evolved for doing lots of low effort contractions. Riding a bike that ‘planes’ takes the edge off high-effort pedaling, smoothing out the peak and allowing the rider to put out more total work for less tiredness. In the last BQ, there’s an interresting statement in the article about the steel tubing of your ultimate bike: a down tube of 0.8-0.5-0.8 seems to not affect the planning. Is it the same for the seat tube? In fact, which tubes should be 0.7-0.4-0.7? We really like 0.7-0.4-0.7 top tubes, but we have found that increasing the wall thickness of the down tube by 0.1 mm doesn’t change the feel of the bike. (All tubes “standard” diameter.) All of these frames are very flexible by today’s standards. I know a number of riders who swear by them. It’s something that merits further study. Biopace rings are not actually oval. They resemble a curved rectangle, and they were oriented or timed roughly 90 degrees differently from typical elliptical chainrings. Round chainrings are a machining convenience. There is no biomechanical reason they should provide the best muscle velocity profile. Rotor used to make a complicated crankset that varied the pedal velocity relative to the chainrings. Currently they make ovalized chainrings, which they claim improve performance almost as much as the cranksets. An independent study is here http://www.rotorbikeusa.com/images/science/pdf/sscivol06no01paper04.pdf. How much racing improvements carry over into endurance cycling is another unanswered question. I can state Rotor’s chainrings smooth my spin and ease knee pain on recumbents. The rings certainly feel different on an upright. I have not tried to quantify a performance benefit (although eliminating knee pain is definitely beneficial!). It seems to me the discussion has largely ignored the biomechanical aspects of planing, sort of the way cyclists fixate on tires instead of aerodynamics. You can hold a tire in your hand but not air. Frames vs muscle dynamics is the same concrete vs abstract contrast. An adjustable oval chainring system like Rotor’s might allow one to tune the bike to one’s physiology rather than gambling on a custom frame. Oval chainrings hold a lot of theoretical potential. However, they also have been tried time and again, and never caught on. If something is tried and rejected, you either have a powerful placebo effect (like narrower tires feeling faster) or whatever it is just doesn’t work. Or it does not work well enough to justify the expense or inconvenience of being non-standard. That said, there are a few pro riders who use oval chainrings. The cameras love to focus on them. There is also a powerful reluctance in cycling to depart from the norm. There is also a powerful reluctance in cycling to depart from the norm. That may be the case with individual cyclists, but I don’t see it in general. Whether it was aluminum rims, clipless pedals or indexed shifting, cyclists were pretty quick to adopt new things that offered perceived benefits. Even out-of-the-mainstream things like wider tires and randonneur bikes have become accepted without all that much delay. Spanish metal amour is great when spelled like French amour. Hope your spellcheck works in 2015, but that would not be as entertaining. Thank you for pointing out the typo! Of course, it should be “armour”. It’s fixed! A real problem with bikes in general, and with topics like planing, chainring shape, in particular, is that tuning may be hard to do, and only apply to specific circumstances. In race-cars, go-karts, and the like, race setups could vary literally by the hour. Even in bicycling, people do things like adjust tire pressures for cyclocross courses basically up to the start line. And so a problem is “how to get a frame, chainring, tires, tuned for best general effect, that work well both in the cold and the heat, on calm days and on windy days, in the dry and the rain, before lunch and after lunch…” This is a much harder problem than the already hard “tweak the bike for some particular circumstance.